This week's Project Life covers the week of August 12-18th. This week was the last full week of summer at our house. The last full week is always jammed pack with fun activities, which is why I included an insert. This is also the last week in the second volume of my Project Life album for 2013. The first week of school starts my third album. For this spread I used the exclusive Elle's Studio September Kit, (which is available TODAY). 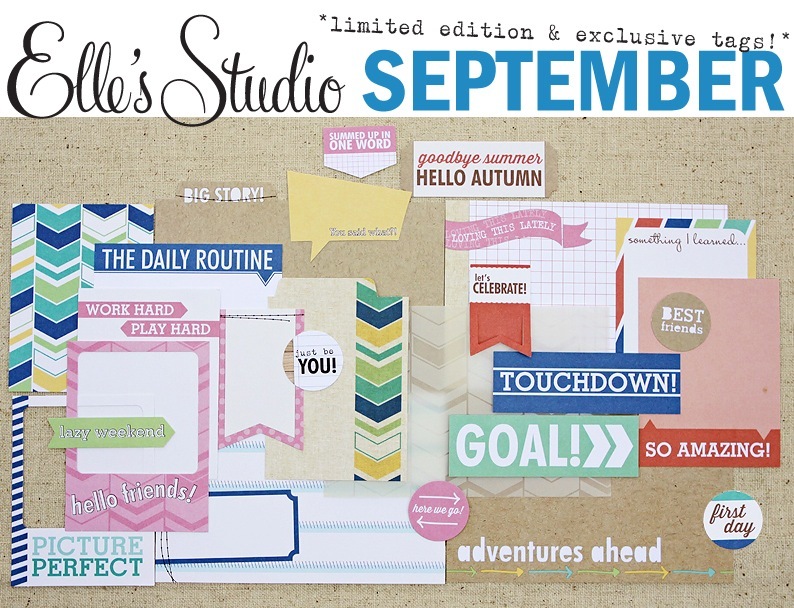 Did you know that our exclusive kits are available for $9.99 on launch day only (regular price $11.99)? That would be today! So hurry and grab your kit TODAY for $9.99! These kits are limited, and once they sell out, we will not be restocking. Have I mentioned they are perfect for Project Life? This week was full-- a trip to the pool, the zoo, bowling, horse back riding, art lessons... oh and my family and I dressed up like the Skywalker family, no biggie. I wanted to use a large photo on the front side of my insert, but didn't have a photo on hand that was enlarged. I found our zoo brochure and I trimmed a photo of a lion and included it on the front. I love the impact the photo brings and that it's trimmed down the center of the image. I included a few items from the Cameron Collection and the menu card is from a past Elle's Studio exclusive kit. I LOVED the vellum card and the "goodbye summer" tag found in the September Kit. I journaled on the kraft "Big Story" card about my thoughts on the end of the summer and layered the vellum on top of the pocketed page. I stapled the vellum to the page and used staples on the tag as well.